Surfing the sunny, warm waters of the Atlantic on Florida's central coast and in need of some major paddling help and sun protection then look no further than R&D Surf for a PaddleAir Ergo. Located in Rockledge, R&D Surf now carries Ergo in addition to their complete line of Ricky Carroll Surfboards and other major brands. R&D Surf at 488 Gus Hipp Blvd, Rockledge, FL 32955 (see map) was established over twenty years ago and is the primary manufacturing location of master shaper Ricky Carroll and his team. Ricky Carroll has the unique distinction of being the three-time winner of the Icons of Foam (Tribute to the Masters) at The Boardroom in Del Mar, California. Checkout his other accolades here. 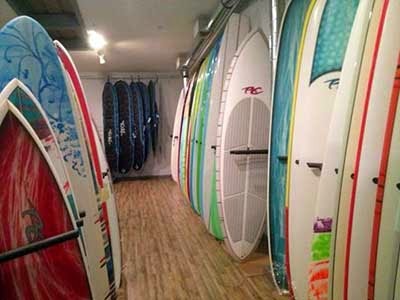 You can contact R&D Surf by phone at 321-636-4456 or visit the website here. R&D Surf is also on Facebook. You can "Like" Ricky Carroll on Facebook too.